Editor's Note: This is the final installment of our series called Things Every Alexa Skill Should Do, which highlights the important features and lessons that every skill builder can use to make their skills more engaging for customers. Follow the series to learn, get inspired, and build engaging Alexa skills. As with any form of technology, you can never have too much testing. You can write unit tests to test individual functionality. You can run through simulations of user experiences. The one thing you can’t easily do it predict how customers will actually use your skill. Getting real customers in front of your skill before it is available to the public gives you an opportunity to collect feedback about what works, what doesn’t, and make improvements that ultimately lead to a better experience. No matter how insightful your voice design is, letting real people try it is always a humbling experience worth going through. 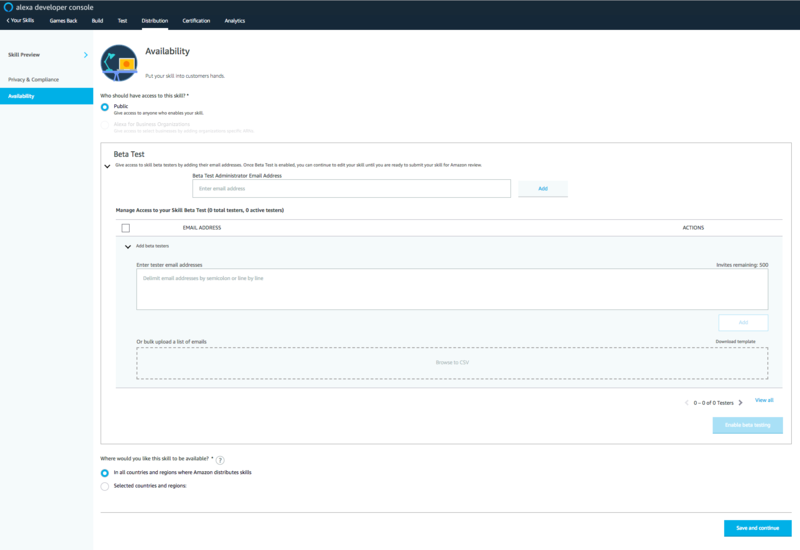 As part of the Alexa Developer Portal, we give you the power to run a beta test of your Alexa skills with up to 500 real users. On the Distribution tab of your skill, there is a section on Availability where you can set this up. All you need to provide is the email addresses of your testers, and you can run a beta test for up to 90 days. Your beta users will get an email inviting them to participate. When they click on the link in the email, the skill will be enabled on their Alexa account. I’ve run beta tests for my last few published skills; in addition to highly encouraging you to perform a beta test on your skills, I want to offer you a few things that I’ve learned about beta testing Alexa skills in general. A beta test is a sandbox that will not carry over to your skill when it is in production. This means any in-skill progress a customer makes in beta won’t carry over when the skill is live. This also means that if your skill contains in-skill purchases while in beta, they can “buy” and try any of your products for free, without actually being charged! Adding users is as easy as adding their email address. However, it’s important to ask for your beta tester’s Amazon email address. You want to use the email address that they use with their Alexa devices so that your skill will automatically be available. When you enter and save a beta tester’s email address, Amazon will send them an email with instructions on how to enable your skill. If your user has opted out of receiving email from Amazon, however, we won’t be able to send it. If you encounter this, there is a link you can give them that will take them right to a page to enable your skill. It’s important to remember that their email address still needs to be in the Beta Test tool before they will be able to use your skill. A beta test runs for 90 days. I recommend creating a short survey with pointed questions to send to your beta testers about every 2 weeks. Did anything not work the way you expected? This regular cadence of questioning also continues their use. Many beta testers, especially if you’re relying on friends and family, will use your skill once or twice during the beta test. Reminding them of your skill and asking for direct feedback will encourage them to continue using it. It will also drive valuable, actionable feedback to your development checklist. I also recommend including a few sample utterances for your beta testers to try. Some of the more uncommon and less obvious functionality is always a great way to get users to try something that they might not have discovered on their own. I certainly understand the need for getting speed to market for your skill, but giving yourself even a week of beta testing with a few dozen users will go a long way in adding the shine and polish that your skill deserves. They will always find something that could be improved, or an edge case you hadn’t anticipated. Beta users are your best friends because they expect bumps in the road. Those same bumps, when encountered by the public, could result in lower ratings in the Alexa Skills Store. That’s why it’s worth the time and energy to do beta testing. For more information about the skill beta testing tool, check out our technical documentation. You can also check out this post for more tips on how to uplevel your skill with A/B testing and more. With more than 45,000 skills in the Alexa Skills Store, we’ve learned a lot about what makes a skill great and what you can do to create incredible voice experiences for your customers. Download the complete guide about 10 Things Every Alexa Skill Should Do for more tips, code samples, and best practices to build engaging skills.